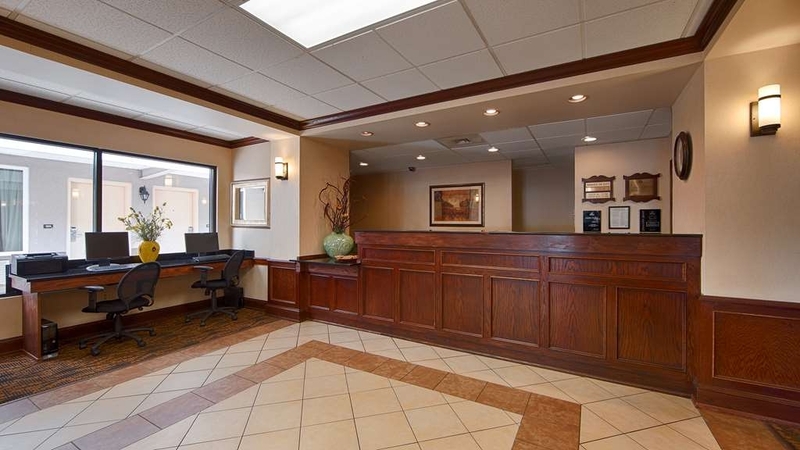 El Best Western Williamsport Inn se encuentra en el centro de Williamsport. Venga y disfrute de las mejores atracciónes turísticas cerca de nuestro hotel. Precios bajos garantizados y ofertas exclusivas. Conozca la histórica Williamsport, Pensilvania, desde este hotel situado a poca distancia de la sede de la Little League. 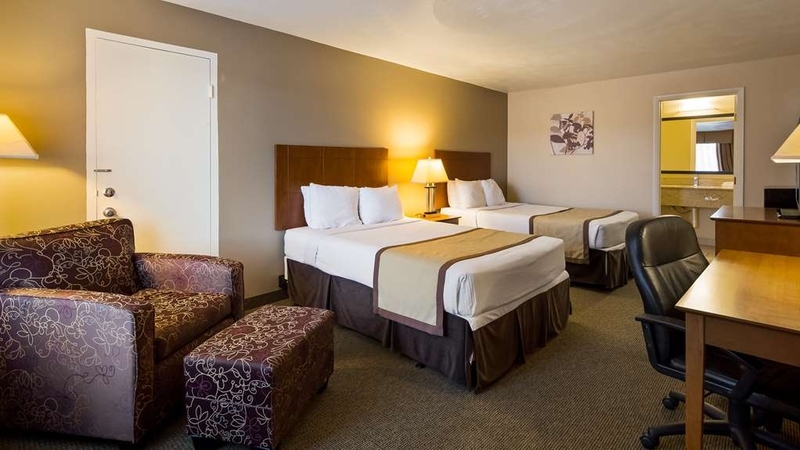 El Best Western® Williamsport Inn ofrece una asequible y cómoda opción de alojamiento para huéspedes en viajes de placer o de negocios. Nuestro hotel se encuentra a sólo unos kilómetros de la escuela de secundaria de Williamsport, el centro histórico de Williamsport y la famosa Millionaires Row. Los huéspedes escogen asimismo este hotel de Williamsport como su segundo hogar para disfrutar de los numerosos eventos celebrados en la zona, entre los que se incluyen la feria del condado de Lycoming, la hermosa estación de otoño con la caída de la hoja, los partidos de la Little League® Baseball World Series, el torneo anual de sóftbol de Elm Park y los partidos de béisbol de los Crosscutters. Este hotel se encuentra asimismo a poca distancia de atracciones orientadas a la familia como por ejemplo Reptiland, Hiawatha Paddlewheel Riverboat, Trolley Tours, el Museo Thomas T. Taber, el parque de atracciones Knoebles y el Museo Infantil de Bloomsburg, ofreciendo una estratégica ubicación en Williamsport. 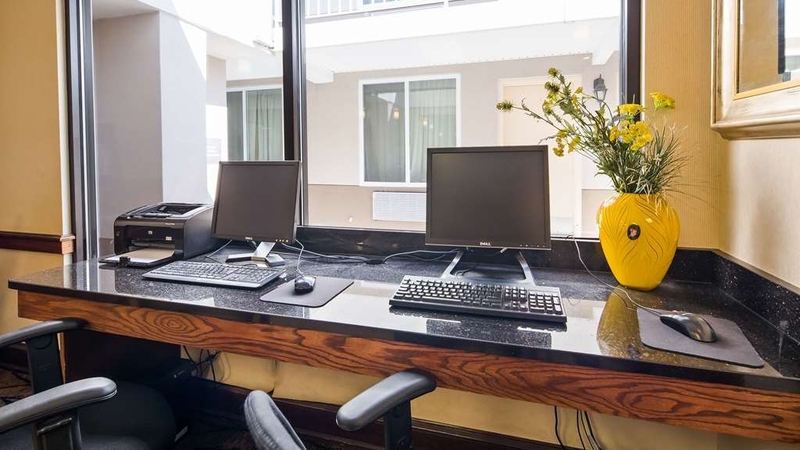 Nuestro hotel es uno de los más confortables del área de Williamsport para viajes en familia o para aquellos huéspedes que tengan previsto visitar a estudiantes o asistir a eventos en los colegios universitarios cercanos. Estamos situados a sólo unos kilómetros del colegio universitario Lycoming y el Pennsylvania College of Technology, así como a poca distancia en auto de la Universidad Bucknell, la Universidad Mansfield y el colegio universitario Penn State. 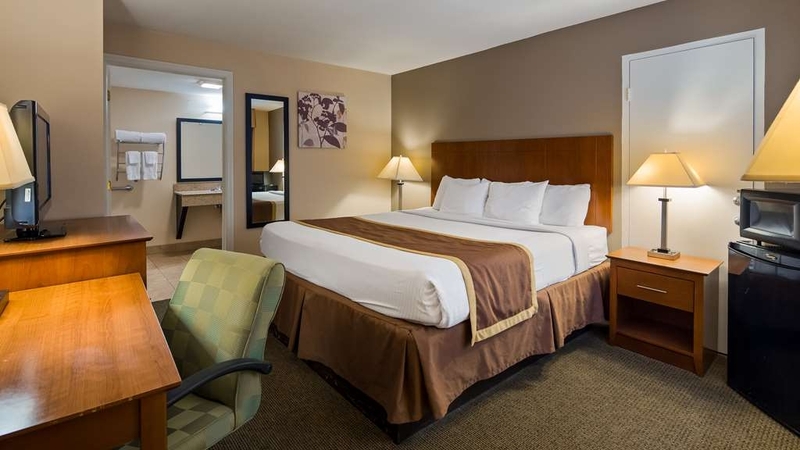 Ubicados asimismo junto al yacimiento de gas Marcellus-Shale, el Best Western® Williamsport Inn es la opción de alojamiento idónea para huéspedes en viaje de negocios pertenecientes al sector del petróleo y el gas. Este hotel de Williamsport se encuentra asimismo junto a la zona industrial de Williamsport, los juzgados del condado de Lycoming y DeGol Jet Center. 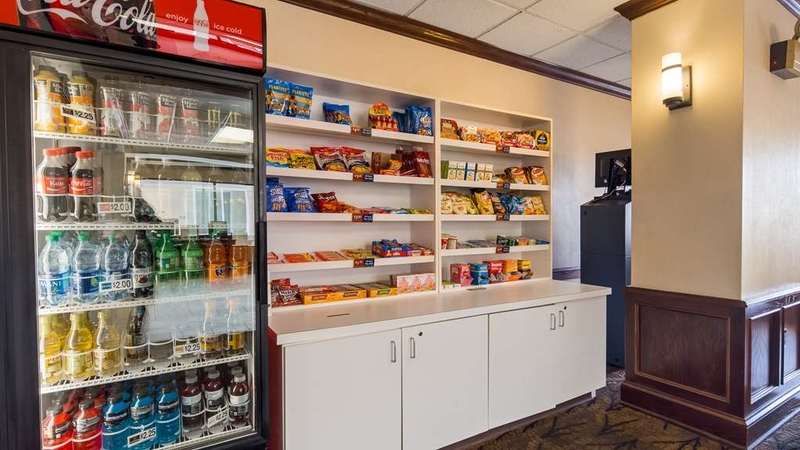 Todas las habitaciones de este hotel que admite mascotas de Williamsport están equipadas de forma muy completa con televisión por cable con HBO®, acceso gratuito a Internet Wi-Fi, microondas y nevera. Nuestros huéspedes podrán disfrutar de un desayuno completo gratuito cada mañana con huevos revueltos, carne, gofres, bollos dulces, magdalenas, cereales, yogur y tortillas elaboradas según sus preferencias los lunes y viernes por la mañana, con la posibilidad además de pedir una bolsa para llevar. Para su mayor comodidad, el hotel está junto a un establecimiento T. G. I. Friday's®Póngase en contacto con nuestro cordial personal hoy mismo para reserva su próxima estancia en el Best Western® Williamsport Inn. First, the desk clerk matched the price I found on the internet. The room was better than I expected - clean, modern, quiet, and comfortable. There was a hot breakfast included, coffee and even decaffeinated tea in the room, along with a microwave and refrigerator. This hotel is by far, the best room you'll find in this area at such a reasonable rate! And friendly staff makes it even better. Thank you we are very glad that you enjoyes your stay. We hope to see you again in the future. Good renovation of a familiar property, a former Holiday Inn. Plenty of Parking available..Location was idea for a stop in Wiliamsport. Good breakfast available for us.Will stop again on our next trip. I stopped here on the way to pick up my new puppy from the breeder. Stoped here overnight to rest with mom. 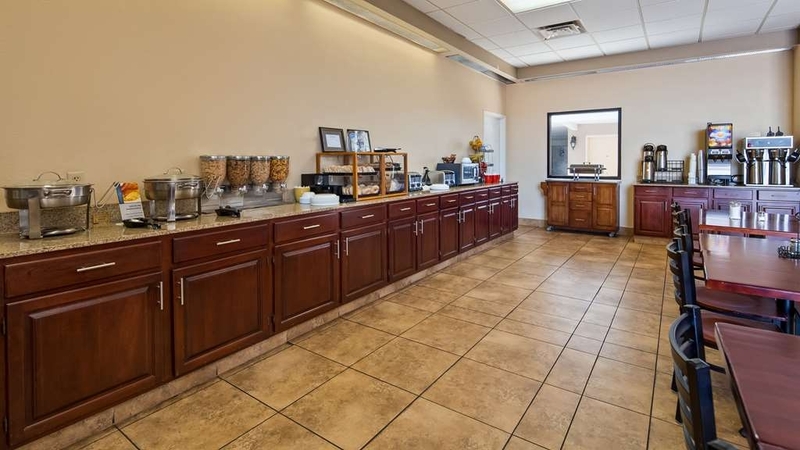 Clean and quiet rooms, excellent service, and a good breakfast bar complete with eggs and sausage. Thanks for the awesome experience! Always clean and very reasonably priced, good value. I stay here often . It is a typical breakfast . beds are comfortable and everything works . Have a microwave and fridge which is very handy.Outdoor pool and you can also use the motel next doors in door pool . 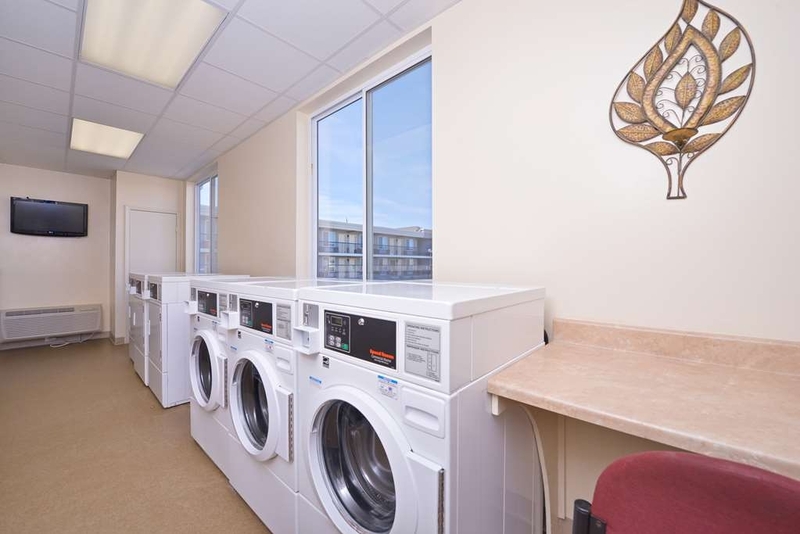 washer and dryers are handy to for a longer stay . "Budget hotels provide better value"
At check-in was informed they couldn't process Discover Card, fortunately I had another card to use. Could not find/connect to the WIFI, was told "we provide WIFI, just doesn't reach your room" Tried to listen to my MP3 player through the clock radio, it was inoperable. TV picture was terrible, unwatchable. Was told by Corporate Customer Service and at Checkout that Maria the manager wold be contacting me. Have yet hear from her. Mattress felt like a hammock. I am sorry that you ran intot his issue as we do have internet at the hotel. I am not sure why Myriea has not returned your call and I am looking into that matter for you. The lady a the front desk was more interested talking in her mobile phone than welcome new guests. We didn't get any information about bad internet connection either. No service equals no return by us. Hotel is more like motel, but rooms are OK, and we slept during the night, all right. Stayed for a quick overnight in Williamsport. Room was clean but very basic. Can't complain, I got what I paid for a decent bed to sleep in. Breakfast was a tad disappointing as we arrived after 9am to find not much selection. There were only 3 bagels, 3 pieces of fruit and some white bread to go along with the imitation eggs and sausage, instant oatmeal & cereal, yogurt. Felt bad for the 8 or so people who walked in after us. It's certainly not a place high on presentation. This was pretty below the Best Western standards. We generally like Best Western properties because we travel often and you know what to expect at one of the properties in advance. USUALLY, we get a CLEAN room, comfortable beds, great WiFI, and a decent breakfast to start the day. As well as information in the room regarding tv channels, information about the hotel amenities, and surrounding area. Oh, and when you check-in they go the extra mile by welcoming you with a warm cookie, along with GREAT customer service, for very affordable pricing. Hence, the reason we choose Best Western properties. 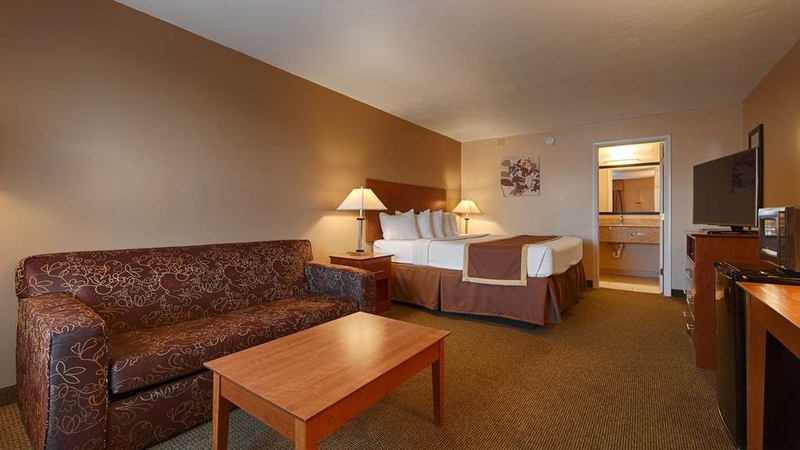 We earned free nights by frequently using Best Western properties throughout our travels. So we chose to utilize those nights at this property since we were in that area. Worst use of our points EVER! We got a filthy dirty room. Only the middle of the carpet had been vacuumed, as the entire perimeter of the carpeting in the room had thick dust along the edges of the floor. There was candy paper on the floor in one of the corners, along with a melted sticky piece of candy at the doorway entrance. Hair on the toilet seat, the remote was sticky, and the beds were not comfortable. There was a hard stiff edging, almost the feel of a box spring edge on the mattress. There was also, no information in the room to remind you of what the hotel offered in the way of amenities, or what any of the channels were on the tv. Since we weren't from the area, the channels are different from ours at home. Checking in process was quick, cold, and no cookies. When I started to ask a few questions I was told, “This is only my 3rd day working here, so I'm not sure.” I did approach the front desk as to the condition of our room. So, a supervisor of house keeping came to the desk, and I spoke with her. She apologized and went on to complain about how lazy the young housekeepers are, and how they don't know how to actually clean!!! It's not rocket science people! On a positive note, breakfast was really the only thing about this particular establishment that resembled a Best Western at all! It fell below expectations a bit, but at least the staff in the breakfast area worked hard at trying to give you a good start start to the day. On another note, there is a TGIF Friday's connected here to the hotel. Also left a lot to be desired! We will never return to this particular Best Western again. Be careful where you use your reward points if you are a rewards member, as you can get burned like we did!! Thank you for your feedback, again I am sorry that we couldn't meet your expectations regarding your stay. On behlf of the entire Best Western Staff I'd like to thank you for letting us know was was wrong. We will make an extra effort to fix these problems in the future. Thanks you! I only stayed here because the Hampton Inn was sold out. It was an awful experience & I'll never stay at a Best Western again. We travel often and we've stayed at some sketchy places, this is right up there! I am sorry that you were not pleased with your stay! Th is place needs a good going over. Room had a bad odor, terrible pillows and matress's sheets had rips and threads hanging from them . Channel up button didn;t work. Btreakfast SUCKED, same thing each day . Would not reccommend this place to anyone. Imagine, you are promised wifi and so you go on vacation with the promise to your boss that you will perform some tasks when you had time. So you go to your room and using a range extender that gave me three out of five bars and NO INTERNET. So believe that means I am connecting to a router, but the router is not connecting to the internet. So I call the front desk and they apologize and the best they can offer is "The wireless around the office is working." Mostly everything else was ok and that raised my rating from "terrible" to "poor". Visiting the area for the Little League World Series. Pricing was way up for the weekend. Had a couple issues: got our room to find that a family was already in it! (hey - mistakes happen!). Bad thing was that the WIFI did not work in our room. We were told that that they had a problem, and we could go to the lobby to use wifi. Very inconvenient. Property was not exactly in tip top shape. Common areas seemed a little skeevey. Breakfast was the basic pancake machine, powdered eggs, yogurt, fruit, etc. People were nice enough. They did allow a very late checkout time . Our family stayed here for almost 1 week due to a local family reunion. Our check in was smooth with Summer at the desk, except I was immediately charged more then my quoted price on the app. Had to talk to Best Western customer service and sent them a pic of quote. It was resolved on our last day there with credit towards our next stay. I will break down review with pros and cons. pros: good breakfast, hot items and continental favorites. Kids liked making their own waffles. Rooms were spacious with plenty of space for bags, etc Conveniently located next to Friday's which we had 2x during our stay. Housekeeping was great except for Saturday 8/11. See photos of disheveled bed. Bathroom counter was huge. Has pool and single story option rooms. Air conditioner worked great except noisy Cons: smelled of smoke in nonsmoking rooms. Kind of musty or damp Motel brought a certain clientele that reminded me of an old apartment complex. They sat in chairs outside their rooms lined up smoking “stuff” in front of no smoking signs. I wouldn't let my kids walk to other families room without an adult. Called front desk but continued the whole weekend. Pool area was never cleaned the whole week we were there. Gross to see towels, clothes and garbage all over esp after the rain storms. Salt water pool, but needed maintenance. Garbage cans around grounds were constantly full and overflowing. Not sure who is responsible for those but def need to address maintenance of pool area and other trash receptacles. Room paint was coming off ceiling and carpet ripping on edges. My husband cleaned 2 big spider webs when we first got there. Our room was clean upon arrival, but our families was not as they “forgot” to clean their room. They checked in late that night so room should of been done. Overall our stay was pleasant. The price was responsible and staff was nice. Would we stay here again? I will look at our options around town. Lots of choices that may be safer and cleaner. Pics are upon arrival. Last 2 pics was AFTER Saturday's housekeeping service. The hotel staff members were very helpful and accommodating. The breakfast is wonderful with both hot and cold items. The swimming pool is very clean. Kids really enjoyed it. The internet was not functioning in the guest rooms, but management was aware of that and working on getting it fixed. We would definitely stay here again. Heavy shower wall was ready to fall off which is probably where the bugs were coming from. Non-smoking room had heavy smoke odor. Ankle deep water when showering from extra slow drain. Front desk acted like it was business as usual. "Ok, but will look elsewhere next time"
There are plenty of hotels to choose from in Williamsport, but we only needed to sleep for a few hours, and got a really cheap rate through a third party booking site. That said, I would choose differently next time. This is an older hotel, with outside entrances as opposed to interior corridors. The weather was hot and humid, and the room was damp and smelled a little musty. There was some commotion in the parking lot during the night, but pretty quiet otherwise. The room was clean, nice towels, but the mattress was lumpy. Overall, not super impressed. We called the hotel about Availability and Wesley at the Front desk was a great help. TGIF Fridays is attached to the hotel. We arrived around 9:30 PM, quick check in and off for a bite to eat. The bed was comfortable and the room was quiet. The breakfast was great and Dana who operated it didn't close right at 9:30 am she allowed people to finish their breakfast. She was friendly and kept the food filled and replenished. Thank you for taking the time to let us know about your stay. We will make sure to pass your compliments along to our staff. "Nice place to stay in a nice place to visit"
This motel was inviting from the outside, the front desk person was excellent, the room was fresh, clean, well stocked with a very comfortable bed. WiFi was good, the room was modern and obviously well maintained. Breakfast was very good, fresh and hot! Thank you for the review we are glad that you enjoyed our comfortable beds and hot breakfast buffet. See you again soon. "A good price and a good stay"
The hotel is a bit older, but the price is perfect and the rooms have all I need and are clean. I've stayed there numerous times. On the whole everything is as it should be. Clean towels, clean room, functioning internet and TV. I have stayed at this hotel since December 2017 and I keep going back every time I am in town. The staff truly is amazing and goes above and beyond. The breakfast is outstanding, the rooms clean I would recommend this hotel to everyone that goes to Williamsport PA. Thank you and I am glad that you enjoyed your stay! "Perfect location & great price"
I am glad that you enjoyed your stay and we do look forward to seeing you again! I will look into the breakfast thing and we are also working on the maintenance as well! My family stayed here for a family event and found the rooms clean and comfortable, even though the building is 90 years old. The staff was very friendly amd helpful. Hotel has a full free breakfast amd free wifi and parking. Pet friendly too! I'd stay here again. I am glad to hear that you enjoyed your stay and we hope that you will stay with us again on your adventures! I'm glad that I came here, everything is walking distance. The hotel is at a great location but most of all the staff is awesome and extremely nice. I would definitely come back to stay when I'm in town. I am very glad to hear that you enjoyed your stay and we hope to see you again soon! "I stay here every month." I stay at this hotel for work every month. It's affordable, has a comfy bed, clean rooms, nice hotel staff, and attached to a Friday's Restaurant. I also feel my vehicle is safe in the parking lot. And Best Western has a great Rewards program. Thank you and we look forward to seeing you when you come in! We are pleased to hear that you were happy with your stay, and we look forward to seeing you again! "Decent budget hotel with helpful staff"
Stayed at this older hotel one night despite the lower than usual rating due to proximity to what we needed to do. The hotel staff was accommodating and friendly. Rooms a little worn but did not feel dirty. Coffee/tea bar was kept fresh and plenty of vending machines throughout the property if you need a cold drink or food. The TGI Friday's is attached to their building and there is a Sheetz and large grocery store across the street. I am happy to hear that you were pleased with your stay and we all hope that you will stay with us again if you travel through our town again! As I've learned to expect, this hotel is typical of all the Best Westerns I've stayed! From the time of arrival, to the time of departure, everyone we came in contact with, was so courteous & friendly. We knew we'd be staying over, on our trip home, so before checking out, booked for that. I am glad that our staff was courteous and friendly as that is what we strive for and hope you have a safe trip and look forward to seeing you after your trip! Good clean hotel for travellers. No restaurant in the hotel, but lots of them in walking distance. For example Fridays, Sapporo Icheban and pizza places. Breakfast in the hotel, Best Western Style. Close to north-south highway. I purchased a King Bed room, and upon check in we were placed in a room next door to people playing loud music and chain smoking cigarettes outside, it was so loud you could hear the music in our room and the smell of cigarettes was bothering my allergies. We asked to move, but there were no more King bedrooms, so we were given a double bed room. The next room did not have a working lock, so we were moved again to another double bed room. Finally we were able to get settled, and the room was fine, clean enough but definitely not the cleanest. It was not expensive, so I could not expect much, but having to move rooms 3 times is not a good experience. "excellent for overnight or longer"
Enjoyed our stay overnight. Traveling with a small dog and the restaurant attached had a patio that allowed the pet to sit with you to eat. Dog walk outside room. Wonderful to have those amenities while traveling. Direct exterior entry. Room updates were nice. Bed was fairly comfortable. Room was ver clean. Breakfast was very good. HVAC noisy. Outside noise penetrated room easily. Water pressure was weak. All in all it was worth the money. This hotel is central to many places in PA, and the rates are good on weekends. Breakfast area is large with lots of options. We stayed here to ride our motorcycle to southern PA and its a great location for a starting point. Easy to find. Honestly, I wasn't expecting a lot from the hotel since the room was only 69$ for the night but I have to say I was pleasantly surprised. 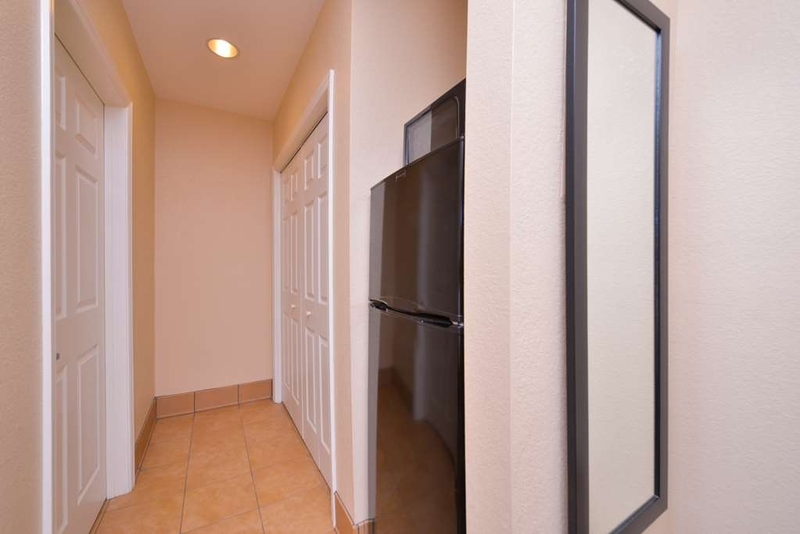 The room has all the amenities you would want: comfy bed, microwave, mini fridge, lighting, and a television. There's free breakfast included in the morning. 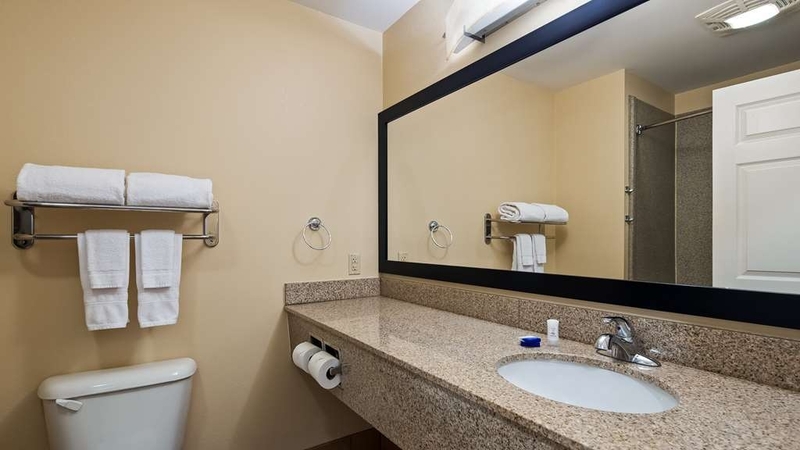 The room was clean and the bathroom looked newly renovated. Was a great stay for one night and will be returning when I visit friends. Room description- Plus: Bed is comfortable. Minus: fixtures in the bathroom were broken and the room had a slight odor. Breakfast was mediocre. Plus- Can't go wrong with fresh waffles. Minus- everything else was poor quality. "No maintenance or housekeeping on holidays"
After unpacking, we noticed our toilet was clogged. Called the front desk and were told no maintenance on a holiday (not even on call). Staff offered another room but after a long drive and unpacking, that wasn't ideal. We asked about a plunger and one was brought to our room, but we had to plunge the toilet ourselves. When checking out, we mentioned the issue to staff and were told the owner doesn't supply housekeeping on holidays either! The only way to leave a complaint was via survey, really sad, would not stay again! "OK...Nothing Special but Not Bad"
Only complaint - I was initially given a room that had someone already in it. I used my room key and opened the door on them! New room was swiftly provided. Just embarrassing to open the door on other guests. "Little League World Series Week"
The hotel is located in a great spot in Williamsport. It is a short drive to the Little League Baseball Complex for the World Series Games. Their is a T.G.I. Friday's attached to the hotel as well as several other restaurants in close proximity. The rooms are clean. The breakfast area provides a solid selection for young and old. "little league world series 2017"
stayed one night at hotel with no complains. Room was very clean and comfortable and close to little league world series. They have a small pool to use but be careful of steps in pool hard to see where they end. The rooms are on the small size but everything worked( AC, TV, refrig and mircowave and plenty of hot water). Also had a complete breakfast for guess. The price goes up because of little league world series but well worth the experience being at the games. If I could give this hotel 0 stars I would. We stayed here last weekend for three nights during the Little League World Series with nine adults and nine kids. All together we occupied 5 rooms at $200 per night! That's over $3,000 this hotel made from us over a long weened. The place is a dump. All of our rooms were filthy and had a stale, musty odor. The bedding is old and stained with holes in the sheets and blankets. The carpet is so dirty you could feel it under your feet. Our shower had pubic hair in it as if it wasn't cleaned after last people checked out. Our air conditioner didn't work so we slept in a stinky, humid room our first night. It was replaced with a new unit the next day. The outside stairwells were old and filthy. The entire time we were there we never saw a staff member tend to the pool. This hotel allows dogs and there are two areas on the grounds where dog owners can get bags to pick up their dog's waste. We saw many responsible dog owners using the bags. However, there still was dog waste all over the hotel grounds where kids were playing. Here's a tip Best Western, if you're going to allow dogs to stay in your hotel, you better make sure the dog waste is being picked up! Nobody wants to pay $200 dollars per night look at or step in dog s#*t! I will say that the staff we encountered were all pleasant and our air conditioning was promptly fixed. It wasn't the staff that was the problem. The hotel is just really old and run down. 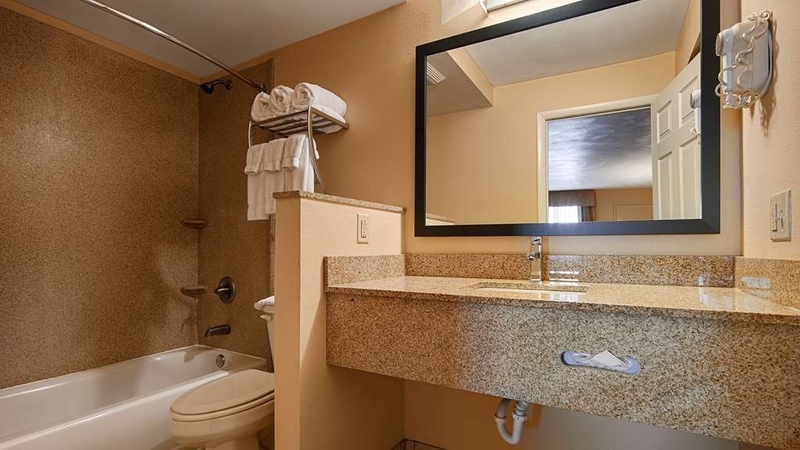 The normal rate for this dump is around $65 per night and the condition of the hotel certainly reflects this rate. It's not worth the 212% price increase they charge you during the Little League World Series! Needless to say, we will never stay at this hotel again, nor will we recommend it to anyone! 0 stars! This hotel is not clean. We had 4 families staying here that all agree this hotel is awful. They allow dogs and they have dog poop all over the grass. They have several areas where the pet owners can get a bag to pick it up, but they don't. They need to make people pick up after their dogs or don't allow them. The rooms are gross, very old towels and sheets with stains all over them. Bathrooms aren't clean. The shower had two temperatures freezing or boiling hot. The shower curtain was too short so every time someone showered the bathroom floor filled with water. This hotel is very expensive to stay in during the Little League World Series. It is not worth $200+ per night. I don't know who is reviewing this with 5 stars or saying it is clean because everything about it is dirty. When we told the staff our concerns they just agree with you and do nothing about it. They knew which guest was letting his dog go the bathroom without ever picking it up and they continued to allow it. The air conditioner was broken in one of our friends room and they had to stay the first night with no air in very hot humid temperatures. Also the complimentary breakfast area was filthy and the eggs were grey. We couldn't even eat breakfast there at all. The pool had hairbands all over the bottom of it and when the kids got out they had hair stuck to them. I would not recommend this hotel! 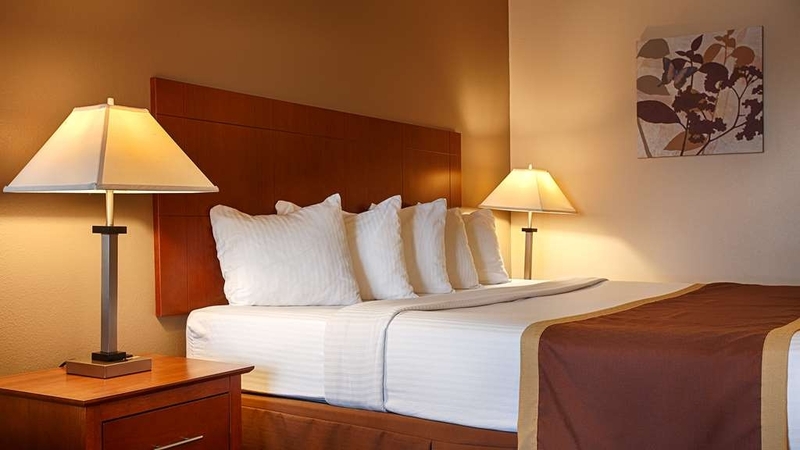 Hotel rooms are clean with comfortable bed and good towels. Check in was smooth and staff was courteous. The complimentary breakfast has both hot and cold choices. Located in the middle of a lot of good chain restaurants very close by including a TGI Fridays basically attached to the hotel. I would stay here again. 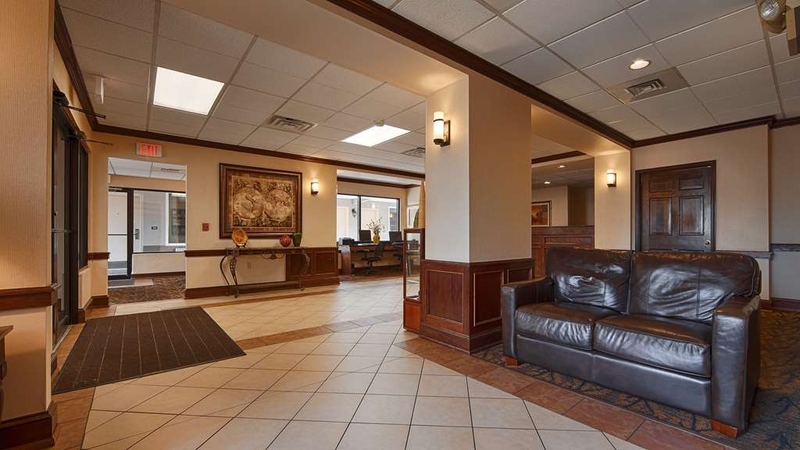 The Williamsport Best Western is a great place to stay for short or long term. The staff is extremely helpful, polite, and professional. They will go out of their way to accommodate your every need. The pool is very nice and clean, there is a gym and the breakfast is awesome. There's also shopping, restaurants, banks, gas stations, everything you could possibly need in the close diameter of the hotel. I'm there on a yearly basis and I'm already looking forward to my next visit in 2018. This was the second time staying here and it was excellent. Room was clean, a/c worked perfectly and the bed was very comfortable. I had reserved 5 rooms and asked that they be put close to each other and they were, side by side in fact. What's nice also is that they gave us ground level rooms which was great because we were able to park our bikes just outside of our rooms. Breakfast was the usual stuff and was presented well. If in area will definitely stay here again. Highly recommend. Have stayed at this hotel several times in the past and it has always been a good experience. Quiet rooms and VERY good sleeping conditions. A complimentary breakfast has been good in the past but unfortunately quite disappointing this time around as the staff was unable to keep the food offerings filled. The staff personnel are friendly and accommodating and the rates are reasonable. Staff was extremely polite! Hotel room is basic, tv, fridge, microwave, their was an oder but I believe it is something to do with the pool. I sell Scentsy so I just sprayed some room spray and it was gone. Bed was hard, so if you like that it was great. For the price of the room, I would recommend. Oh and it is loud, you can hear everything, I was wide awake by 6:30 both days with people leaving. But it wasn't an issue for me. Only hotel in W-port w/outdoor pool and very nice. Staff is friendly and attentive. Nice breakfast. Convenient to town and colleges. Lots of restaurants and shopping nearby, I don't know what else to say as they are making me expand this. Rooms are nic and clean, Shower has good pressure,Bed was comfortable but I dont like the thin covers. Breakfast was average. Connected to a TG Fridays resturant. Good food. My only real issue are the exterior stairwells. These need pressure washing and paint. Makes the rest of the motel seem dirty. This is the 2nd time we have stayed at this hotel and enjoyed our stay both times. The location of this hotel is perfect, the staff are friendly and helpful and the rooms are comfortable. We would stay here again in a heartbeat! "A rarity in a hotel- a comfortable bed!" Most hotel beds are so hard that I can't sleep! As the baby bear said- "This bed was just right!" I actually got a good night sleep! The room was clean; however, we didn't have any toiletries. We worked around it. Desk staff was friendly and helpful; check in was quick. I was rudely awakened around 5:30am by people talking loudly outside our room. I don't know if they were guests or employees. People should realize that most hotels are not built with the best of insulation or sound proofing and should keep in mind that most loud conversations are heard by many people. My only other complaint- please bring back the full size pillows! Those half size things are for the birds! 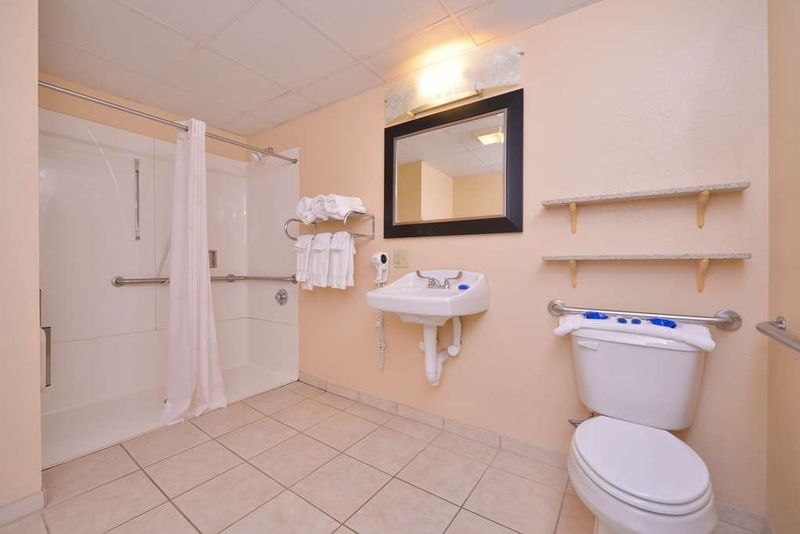 This is a very clean, nice Best Western. Staff was very friendly and helpful. Only issue I had was the breakfast was only average to below average. Had all the basic foods, but eggs weren't tasty and bananas were too ripe, maybe it was just a bad morning. TV was great, room was clean, free internet worked well. 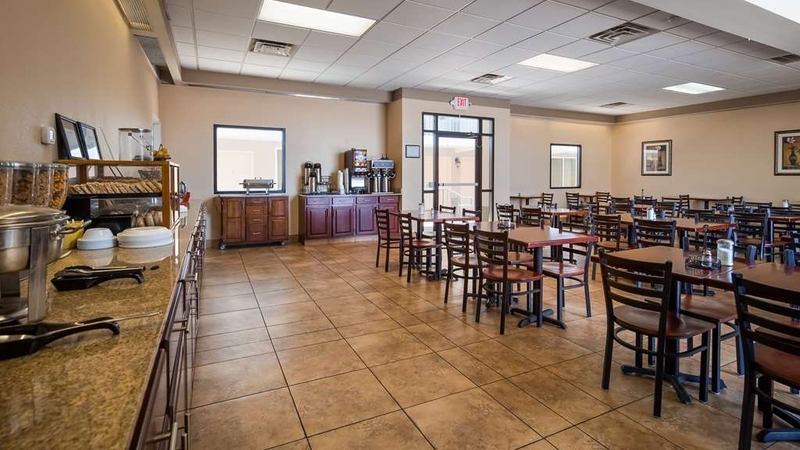 Location is easy to get on / off interstate, with plenty of restaurants within walking distance if needed. This place seems to be an old motel which has been updated and renovated. A very good job was done. My room was attractive and comfortable, and the firm king-sized bed was excellent. And the free breakfast was above average (make your own Belgian waffles!). The hotel was very clean. Staff needed alittle more compassion for travelers.We traveled on motorcycles and asked to put them in a safe place and were told they had no spot to put them in front of motel in the light where they could be watched. Clean rooms, comfy beds, spacious room, nice big bathroom and an almost full size fridge in the room. The pool was a great attraction for the kids but it was a little small. The breakfast was wonderful and the staff was great. It was a very pleasant stay. The other guests were courteous and friendly as well. It was not good experience for stay one night. The room was not ready when we check-in and we had to waiting more then 20 minutes. Bed sheets looks that is not replaced from last guests. Noisy Air conditioner cannot turn on while sleep. 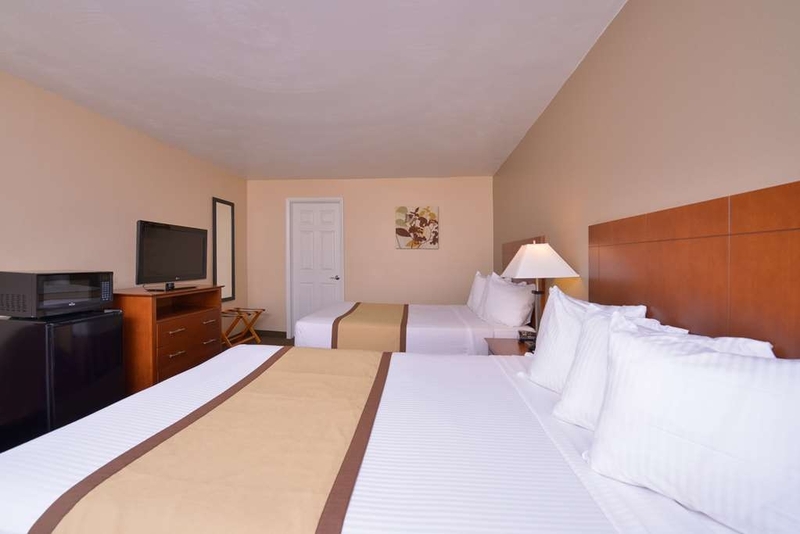 The rooms are very clean and the staff is very helpful and friendly. 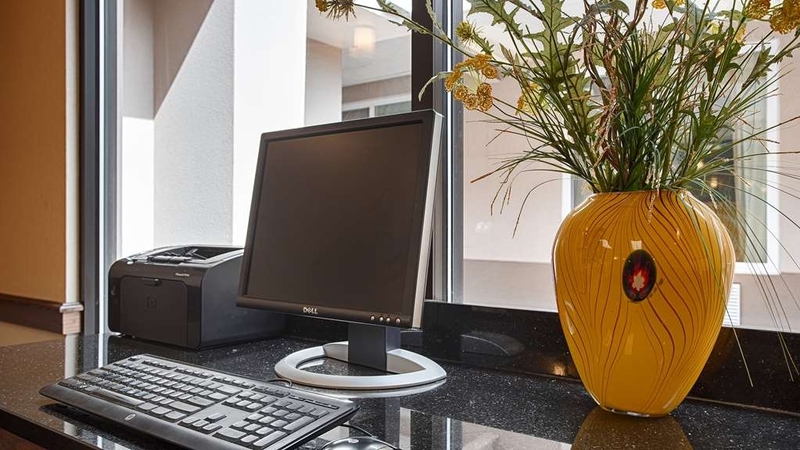 Housekeeping is very attentive to any requests willing to suggest restaurants and other activities. Even though they were very busy it was quiet and well kept. Also, very convenient location. The hot breakfast was okay, but we chose to eat out after the first morning. I highly recommend. The room seemed to be very humid. The sheets were not comfortable. The TV in the fitness room did not allow you to change the station. The pool area was not neatly kept and the whole pool area needed some work. It did not look inviting at all. Lost my credit card today on my travels and the other card in my name works infrequently in the USA (I'm Canadian). Clerk denied me a room even with another credit card number (with authorization of use letter - is my fathers) and a cash deposit. Thanks for nothing at 1 am. The Best Western Inn in Williamsport is one of the cleanest hotels I have stayed in. I slept in peace with no worries of bed bugs. The bed was very comfortable and the air kept the temperature in the room at a comfortable level. There was plenty of hot water available for showering. The WiFi was strong and reliable. 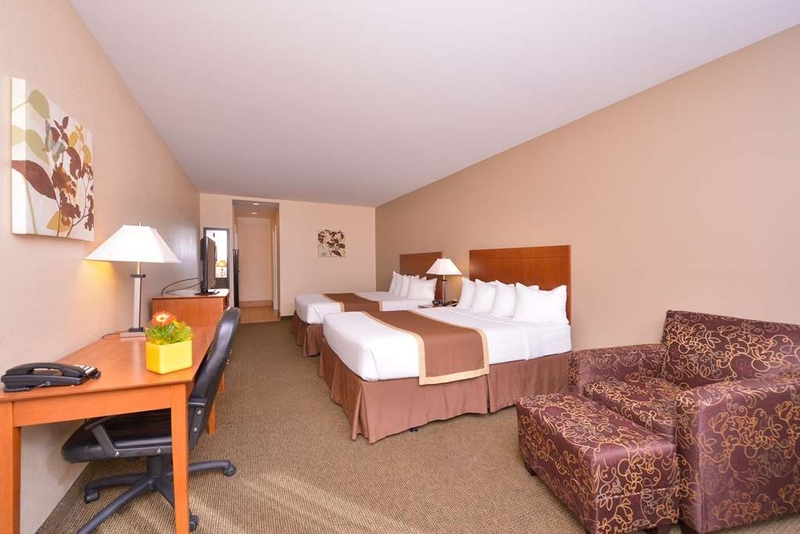 This is a two story Best Western with access to all rooms from the outside. The hotel appears to have been recently remodeled. The interior and exterior of the property looked to be well-maintained. I did not use the swimming pool but it appeared to be very clean. The dining hall offered a nice range of breakfast foods including more homemade options including eggs, sausage and danishes and standard items such as waffles, cereal, fruit and yogurts. The breakfast staff was very friendly and involved me in conversation. TGI Friday's is attached to the hotel. Additional restaurants are available in front of the hotel and within a short walking distance. Bottom Line: I highly recommend staying at the Best Western in Williamsport. If I travel through the area again and need a place to stay, the Best Western will be my #1 choice. They went out of their way to be helpful and made my stay very pleasant. The room was cozy, quiet and clean. The breakfast was great. Eggs, sausage, waffles, pastries, bagels and even sausage gravy and biscuits one morning. Everything was fresh and tasty. I will be back! We stayed as a leisure group for three days and it was an enjoyable experience with plenty of dining on-site or with in walking distance. The pool was clean and clear. They allowed us to park our motorcycles outside our rooms. Experience was great, very clean, soft towels and friendly staff. Parking right in front of your room, nice restaurant attached. Other restaurants in walking distance. Also, Harley Davidson Dealer in walking distance. This is my 3rd time staying here, I think, & I would highly recommend this hotel. Plenty of truck parking, clean & quiet rooms, very kind & accommodating staff & a b/fast that seems to get better each time. Oh yeah, o/side pool & fridge/mike in every room. Priceline price was phenomenal! .....& all the time GOD is good. Be blessed! I stayed here as part of a Titan Tour with a group of people. Our package includes porterage but when we arrived there was none. our room was ground floor fortunately,but the stair banisters were loose and dangerous. The room was filthy, the sheets had not been changed on the bed (there were hairs and pubic hair in the bed)and the carpet was disgusting. The bathroom had chipped and broken tiles. The 'free' breakfast was terrible (scrambled eggs in blocks?) . We were all glad to get out of there after one night, I would not have stayed for a second. We were told that Titan had not used it before and said they would not use it again. The TGI Friday was very noisy, we went to the Olive Garden across the road which was lovely and very reasonable. 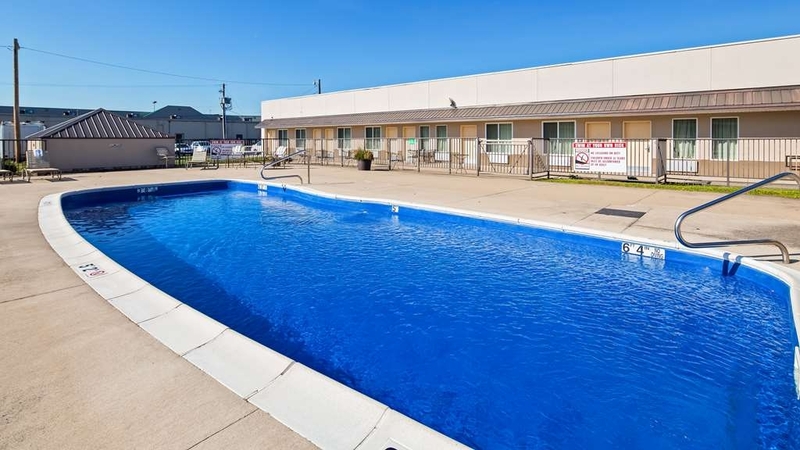 "Clean comfortable King size bed "
Selected at the Last minute great service love it Great front desk staff everyone was helpful also we used the pool at the candle wood they were great also my kids were able to swim so we really were satisfied. Very glad that you enjoyed your stay!!!! Our stay at the BW was very nice. The room and bath were very clean. The bed was very comfortable. The breakfast was good and the staff was wonderful. If you need a good basic hotel, this one is a very good value. Very gald that you enjoyed your stay and we hope to see you again in the future! I had a wonderful stay with my daughter. The room was nice. The bed was a queen but the mattress was not as comfortable as my home mattress because I am used to my memory foam. The housekeeping staff and breakfast staff were very friendly. I would stay at a Best Western again and even signed up for the Rewards program. I am so glad that you and your daughter enjoyed your stay and we look forward to seeing you again in the future. "Great little place to stay!" I am glad that you enjoyed your stay and we look forward to you visiting us again! The beds was very very comfortable. Slept like a baby!! The frig worked great! Few minor maintainance issues and breakfast should have more varity other than the same thing almost everyday. Front desk c/I was ok but c/o was terrible. The lady was missing for close to 30 mins and I called multiple times. We left around 6am. The restaurant was ok but very expensive (TGIFridays). I am very sorry that you encountered issues with the check out and I am addressing that issue because this is not our standards. I am glad that you enjoyed the rest of your stay and I am looking into some other options for breakfast. I am truly sorry that you encountered this problem. Staff should of handled this situation better and I have spoken with them and this will not happen again. I am truly sorry for the discomfort of your stay. I am very pleased to hear that you enjoyed with us,a nd we look forward to you visiting with us again if you are ever in the area. I thought this hotel was worth the money and I would stay here again if I am back in the area. The staff at the front desk was courteous and helpful. Housekeeping was friendly and our room was clean. AT breakfast the person in charge of it, Linda, was very nice and spoke to every guest who came in. She kept everything well stocked and was very helpful with places to go to and local places to eat during our visit to Williamsport. Actually I was impressed with the people of Williamsport. Everyone was so friendly and helpful and it was appreciated. 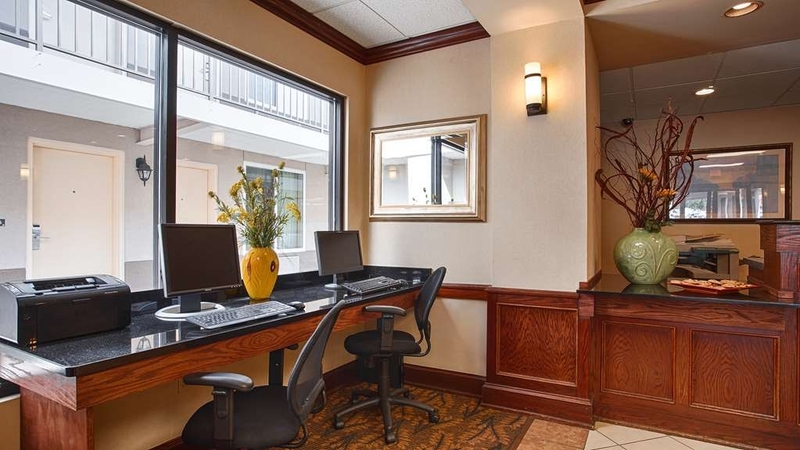 I am so glad to hear that you were very pleased with your stay, that is what we strive for here at Best Western. 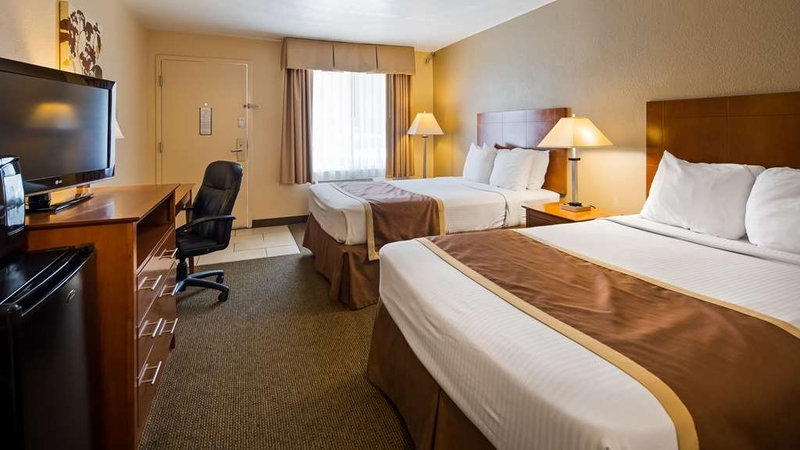 "Great stay, clean room great staff." Had to stay here due to snow storm Stella. Tiffanie met me at the desk and she was awesome. Met another staffs member Judy B who pointed me in the right directions for all I needed to beat the winter storm. Stayed 2 nights in a great room, talked to great people who care about their guests. If I have to stay in town again I known where I'm staying. You should too. Thank you for the great comments and I will be sure to let Tiffanie and Judy know what great words you had to say about them. Thank you and we hope to see you again soon. I am glad to hear that you always enjoy your stay with us and we look forward to seeing you again. A nice little hotel. Clean and looks recently renovated (?). Pleasant staff and restaurants nearby. Not difficult to get to but you can drive right past it if you aren't looking on this bustling thoroughfare. Far enough off the road to be quiet, which is nice. Thank you for staying with us, and we look forward to having you stay with us again on your travels. This was the best dog friendly place we've ever stayed. Room was spotless and very comfortable. We stayed with our 2 show dogs - a Great Dane and golden retriever. We were able to get a non smoking room so no worries about that horrible cigarette smell on them and us. We had all the comforts of home. Will stay here again. I am very pleased to hear that you were very happy with your stay. We look forward to seeing you again and wish you and the dogs good luck with all your travels. "Hotel condones harassing and threatening guests"
Staying here over Memorial Day and several other drunken guests decided to be loud until close to 11:00 o'clock at night. After several calls to the front desk and the clerk being threatened by these guests, they stood outside our room and declared that they would make as much noise as they wanted. I was followed to the front desk while I made a complaint and threatened as I returned to my room. We had to move to another hotel because we feared for our safety while the drunken trouble makers were allowed to stay. We went to Pa Grand Canyon and Wellsboro for a weekend getaway. Beautiful color to the mountains. This Best Western was only 40 minutes away and we had a very pleasant stay. Loved the staff. Easy access. I am very pleased that you enjoyed your stay here with us and were able to enjoy the Pa Grand Canyon and Wellsboro it is definitely beautiful this time of the year. Good for 1 night stay. Double bed room was small for 3 people but manageable. Continental breakfast was prefect in the morning. Waffles, toast, eggs, sausage, cereal, juices, coffee. Everything you could want for breakfast, they have! Located right beside TGI Fridays, which was a perfect spot to have dinner after a long day of driving. Front desk staff and breakfast staff very friendly, kind and helpful. Nice spot to stay for visiting the Little League World Series museum and stadium grounds. One of the rooms near us was having a bachelorette party in the middle of the night, which was annoying as we were trying to sleep. We saw their party bus in the morning. Don't know how long it lasted but it was long enough to disturb you. Other than the noise it was a good spot. Thank you for your for leaving us a comment on here, and I would like to apologize for the noise from the other guest. We normally do not have that kind of problem and I do hope that you come to visit us again in the future. 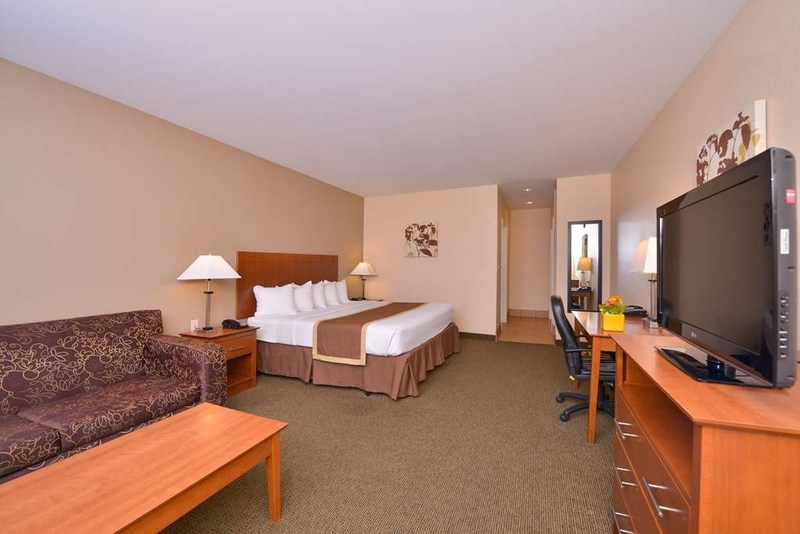 We travel to the Williamsport, PA area several times a year for business at always stay at the BW. 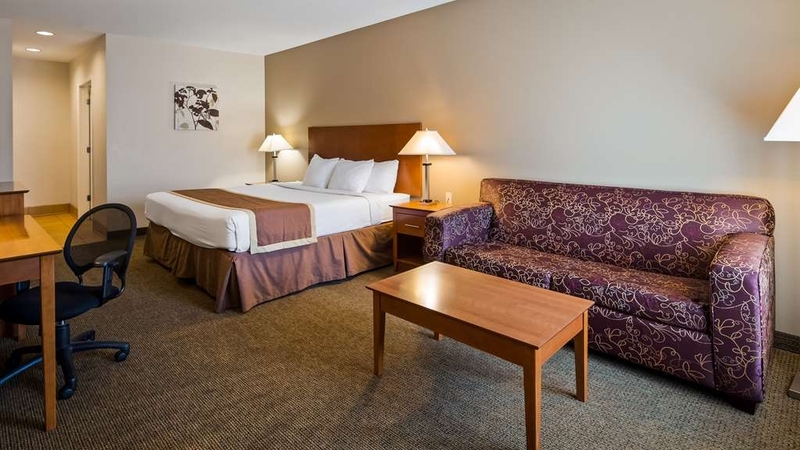 Hotel is conveniently located and a great value. The staff is always friendly and helpful. Included with the room is a good breakfast with a variety of food. Thank you Gary, it is always good to hear that the staff is friendly and helpful. We greatly appreciate having you as a guest here at the Best Western and look forward to seeing you again. We stayed here and enjoyed our stay. Great clerk at desk offered popcorn and provided us a water and bag of chips.. the room was clean and comfortable. Good breakfast in nice room. Really good restaurant with bar on site. Shopping center next door. I am glad that you enjoyed your stay here at Best Western and we hope that you will stop and visit us again while you are out traveling. Thank you! "A good place for a stopover"
As with all Best Western sites, this hotel was a comfortable place to stay. It was nicely decorated and clean, but not quite as "posh" as we have grown accustomed to with this chain. We were near the stairway and heard some noise early in the evening, so were dreading what might happen later on. Fortunately, this did not materialize. "Great personal attention to detail"
The staff was very friendly and very helpful I left something behind of great value and they found it and held it at the desk till I could return and pick it up. Very honest and for that I am grateful. 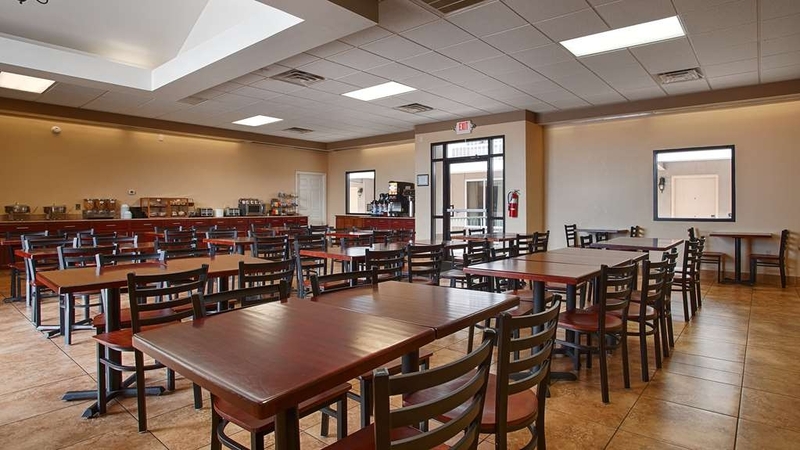 Clean, comfortable, good breakfast, and staff is always friendly and helpful. Good value for the money. Good central location and the adjacent restaurant is very convenient. Walking distance to several other restaurants. Clean and comfortable beds & room, great shower, very nice breakfast, breakfast was much more then we expected., great friendly staff. Location was perfect for our trip. When in the area, will stay again. Arrived in the evening and left early in the morning so cannot comment on the amenities other than the breakfast which was your standard complimentary breakfast. The room was clean but a bit dated. The hotel was fine for a short stay. 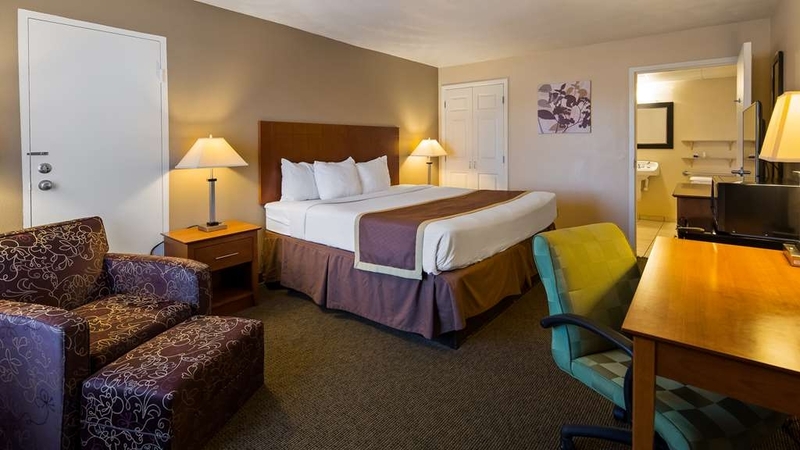 "Great Location for the Little League World Series"
Very comfortable place to stay when you're on the go to watch the Little League World Series! 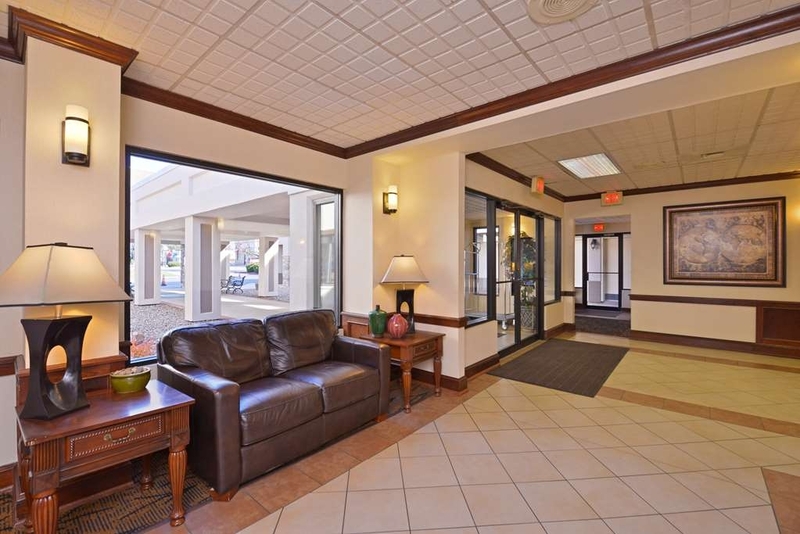 Ideally located within 2 Miles of driving distance to the Ball Field. Easy to get to and from the Hotel! Breakfast was fantastic, Egg Omlets and an assortments of breakfast items to choose from wether your on a diet or not! LOL!!! Just OK. This hotel is sorely outdated. What saved it for us was that the room and pool area were very clean, so we felt OK staying there, and we were able to get a low rate. The furnishings and finishes are very basic and somewhat mismatched. There is an outdoor pool with chairs and tables that are mismatched and look as if they have been purchased locally. The front desk staff is friendly, but they did not seem knowledgeable--we checked out with gift certificates and the desk attendant didn't know how to process them. This is an old-fashioned set up where the rooms open to the outdoors. In addition to the large pool area, there is a small gazebo and some larger groups gathered there at night. Nice if you have a group, but I can imagine that it could be a problem for others if the people were loud. VERY large space for free breakfast with some hot food. That was a pleasant surprise. TGI Friday's is attached and there is a lot of shopping and dining close by. Easy on and off highway. Huge closet space. "Might have been a great stay..."
My family and I stayed during LLWS, a change up from our normal hotel. First room we were given had been cleaned, I'm guessing, halfway. One towel in the bathroom and dead gnats on one of the beds- I'm guessing from cleaning with the door open as there are exterior corridors? I was about to call downstairs for more towels when we figured out the door did not lock. As in you could push the door in from the outside. We called the front desk and they were more than accommodating, even bringing new keys to the room but did not want to see what we were talking about. The new room was cleaned much better. The outdoor pool is quite small for what you would think and the ground around the pool had something similar to peat moss floating in pools of water. We did not have time to stay for breakfast, weekends are served at 7 am and we had to leave well before. If the stay had been the usual $100 a night, maybe it would be worth it, but the price was doubled due to the event in town. Not worth $200. "WOW to the free breakfast!" "Don't go during a Family reunion......(That's not yours)"
OMG, The Family over ran the place, with kids, dogs and rude people! We were there from Friday till Monday but they all left Sunday morning. They put a sign on the pool gate saying it was closed for family (no one informed us on check in) They partied on the Saturday nite by the pool till 1:30 in the moring .....Where is the STAFF in charge? The manager who showed up Monday morning apologized and made some compensation but our weekend way ruined by the noise, kids with water guns and yappy dogs! Also crazies looking for ice at every machine at 4 AM. I had a flea jump across my chest while in bed.....how nice is that! Might be better acomodations elsewhere! "Great family stay during Little League World Series"
We had a great time staying here during the Little League World Series. The staff was amazing. Diana, our housekeeper, went above and beyond to make us comfortable. The hot breakfast was a definite plus. Internet service was not so good when the hotel was at capacity. Lots of kids and baseball fans. Good memories for our family staying here. Stayed here only one night, and would stay here again if in the area. Very nice room, friendly staff, very nice breakfast. The only problem was the mattress was not the most comfortable. Has a pool, although we didn't have time to use it. We didn't think it was noisy. Great Staff / Room / Amenities / Location / Excellent Value for the $$. A/C in our room was OK, but not strong, we did not report the problem because we were leaving that morning. We did not receive our 7:00 AM Wake Up Call, but we had also set the alarms on our phones so we were fine. Exceptional & Friendly Staff and the numerous pluses we experienced far outweigh the 2 minor issues we had. "Clean, but noise is unbearable"
There is a family reunion with several children who are pounding on the walls, racing desk chairs up and down the sidewalk, screaming. The room is very clean and spacious, but the other guests have ruined our stay. The location is nice with many restaurants nearby. We enjoyed our stay and appreciated that our dog was welcome. Breakfast was nice too! The reservation making was easy and the hotel was as expected - comfy, quiet, and clean. Best Western is reliable. Overall we were pleased with our stay. Our room was clean. Nothing special, but perfect for one night. The sheets felt "well washed" but at least they were clean and fresh. Location was great with easy access to lots of dining and shopping options. We would stay again next time we are in the area. 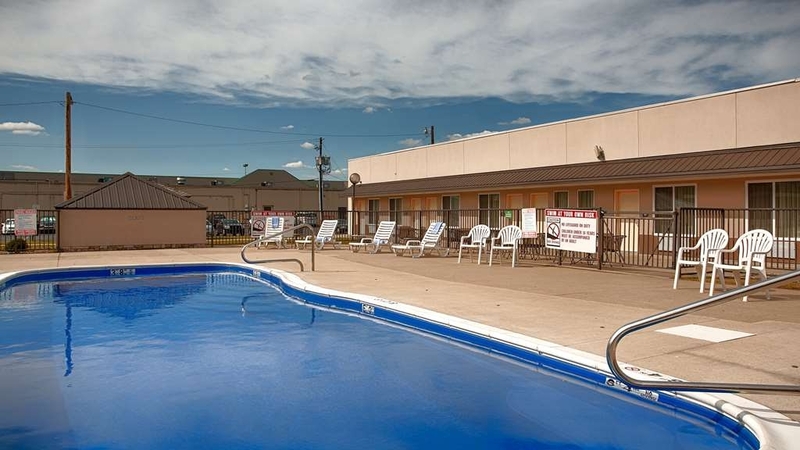 was pleased with everything overall, was able to park motorcycles right outside room, location was pleasant, plenty of resturants within walking distance, had a pool, would stay at best western again, was a choice due to my membership in H.O.G. We arrived late and left the next morning. Very friendly check in. Price was terrific. Room was nice. Coffee maker in room. Extra towels were appreciated. Breakfast was offered although we did not have it. "This place is HUGE "
I found this place on Trip Advisor & was very pleased w/ it. They had a huge lot on the side to park my truck & the girl at the counter hooked me w/ a room by itself, way off in the back corner. I went running in the surrounding n/hood & it is like the epitome of scenic & peaceful. The outside pool was decent size, the exercise room was pretty weak, though. There was 4 dumbbells & it was really small. All the staff that I met were super friendly & the B/fast was awesome, stocked well w/ many hot & cold choices. The scenery is out of this world up here. I would def stay here again. Be blessed! 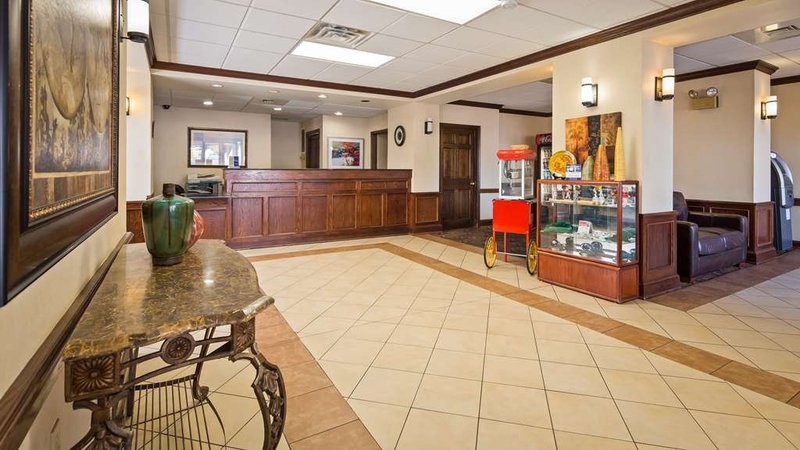 "Great Place for th Price"
This hotel is a very reasonably priced hote in the Williamsport area. Very clean, well kept, has a pool and fitness center. They do a great job on breakfast. I have stayed there numerous times both for business and with family. The best western was a great stay. I'd stay here again! Our room was clean, bathroom, linens extra. The bed was comfortable and big. The room was up-to-date with nice semi-modern decor. The staff was SUPER friendly, kind and helpful. They were welcoming when we entered. Speedy with the transaction and gave helpful tips and information that we needed/possibly wanted to know. The pool was small but great on a hot day! The kids loved it! They had nice lounge chair. Modern anti-gravity. Overall a wonderful experience. I'd stay again and recommend to friends! Our girls travel softball team stayed for two nights. The rooms were clean and the motel's staff was great. Our girls had a very early game and the staff backed our team breakfast in a bag to accommodate our teams needs. This was above and beyond expectations. The motel was also very close to shopping and restaurants. "Best Western is absolutely the Best!" We traveled to the area to pick up an eBay purchased vehicle and stayed overnight at Best Western. Very nice room and really comfortable beds! Room was very clean and everything expected was there (coffee maker and coffee, microwave, refrigerator. Being on ground level, we were able to park right in front of the room so loading/unloading was easy. I highly recommend this hotel if you're in the area! We were passing through and stayed the night at the Best Western. The rooms were fairly large, and very clean. The bed was comfortable, and the shower was good. There was a TGI Friday's on the premises for dinner. They had the typical Best Western breakfast buffet, which was filling with good quality. Friendly staff. Decent breakfast. clean rooms. good proximity to points of interest in the surrounding area. Would definitely recommend. I will be sure to swing by the Best Western in Williamsport, PA next time I'm in town. 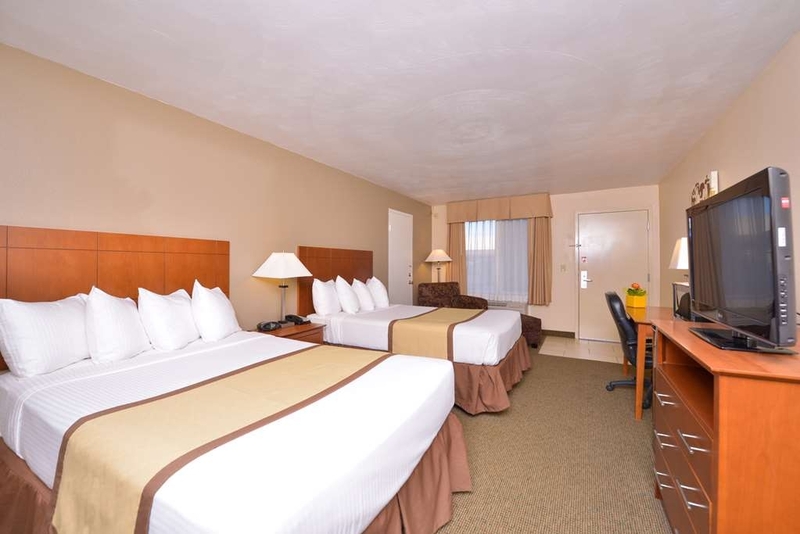 From the newly renovated rooms to the cleanliness of the grounds and public areas everything deserves an A+ The hotel is in walking distance to many restaurants (also has one attached) and shopping. The free hot breakfast was great with eggs and sausage, waffles, bagels, pastries, fruit, cereal and yogurt. The employees were very nice and helpful. I will definitely stay at this hotel again when I am in the Williamsport area. "Stay for Car Show at Penn College of Technology"
Hotel was clean. My son enjoyed the outdoor pool. The staff was very friendly and helpful. Breakfast was available during our stay and it had a nice variety of food options. Lots of restaurants near the hotel within walking distance. We rode the motorcycle down to PA for a quick getaway . The hotel was easy to find and the staff was very friendly. The rooms were very clean and very big. The outdoor in ground pool was right outside our room. We met great people and had a nice time relaxing and riding through the hills downs and back. I travel thru this area on a regular time table for business and look forward to staying at this hotel. This location has many good restaurants including within the hotel itself. There are several sports minded restaurants close by and several Brew Pubs that stand out for Brews and food. Needed a hotel on the way back to Canada and found this one while driving north. We were very pleased with the choice. Great location, Friendly Helpful Staff. Clean property with a restaurant onsite. Felt safe in the neighbourhood. Full disclosure: I do not like hotels where the rooms open directly to the outdoors (as opposed to hotels with interior hallways). And, I got this room fhrough an online deal. Let me also say upfront that the staff here are excellent, warm, friendly, and lovely. I felt very welcomed, and i go the impression there was little they wouldn't do for a guest. Very refreshing, although I always find people in Williamsport exceptionally friendly. BUT even the best staff cannot make up for poorly planned facilities and rude guests. This was my first stay at a Best Western, and it will be my last. The desk manager was lovely and terrific. So were the cleaning staff, who helpfully showed me to my room. However, I had issues with the way this facility is built. I didn't feel particularly safe, and the way it's built magnifies every tiny little noise Concrete walkways magnify footsteps, and concrete canopies over the walkways, plus a building that is built with different sections - again, with walkways and canopies -- act like a huge echo chamber It's horrible. Around 11 pm a large group (family) of people, taking up, I'd guess, 3 separate rooms, arrived, made a lot of noise Knocking on each others' doors, kids, I heard furniture scraping around, yelling -- just non-stop noise. I nearly called management, and I should have; they probably would have addressed it ... but I don't think these people would have got the message. They were just culturally loud people. So, having been kept awake, I was awakened early in the morning by people leaving. Why? Because they slam their doors, talk in loud voices, and don't give a hoot that they might be disturbing other guests. The cleaning staff are to be admired for being on the job early, but their carts squeak and make lots of noise as they go up and down the sidewalk. Again, early in the morning. In fact, a cleaning person knocked and opened my door. Thankfully I had it semi-locked -- but why disturb people when they haven't checked out, and you know they will? Is that such a huge problem to solve? It's called a list. I opened the ice bucket and to my disgust, saw a bucket full of water with two old creamers floating in it. Towels were hard and scratchy as nails, not very white. Bath towels were small. The massage shower head apparently had broken at one point, so instead of putting in a new unit, they improvised a second holder that didn't fit. Consequently when I turned on the shower the shower head jumped out of the holder and sprayed me and the entire bathroom. Went to breakfast, and the same rude neighbor family was in the breakfast room, taking up about 4 tables they'd put together, loudly talking, uncontrolled children making the other guests cringe. One was walking out with her breakfast, looking rather unhappy, as I came in, and I soon found out why. Another young family sat at the other end of the room, away from them, and another couple sat unhappily in their seats. I made my breakfast and took it back to my room. (Only to be disturbed by the cleaning person) People, if you're staying in a hotel, get a clue. It's not all about you. I don't think this was a bad family; they were probably nice but they come from a loud culture. I'm not at all a prejudiced person, anything in my life would bear that out -- but I felt if I complained, it would be viewed as a semi-bias attack. For all I know they'd saved for some time to go on vacation, or perhaps were on their way to somewhere special. I didn't want to ruin their trip ... but why do other guests have to suffer from thoughtless, noisy people? Be a good guest. Talk in quiet voices. If you must check in late, do so quietly If you're an early bird, be quiet for those who aren't, or for those who have been kept up all night by their noisy neighbors. Close your door quietly. No need to slam. Be considerate! And if you're in a public dining space, don't hog all the seats and make it difficult for other guests to get their meals and enjoy the common dining area. Oh, and I was greeted by the sound of a motorcycle starting up outside my door. No, the parking area was not near our rooms. Someone had parked his bike outside his room. It was very nice of management to accommodate him, I'm sure he was worried about his bike being stolen. But have some consideration! Walk your bike out to the parking area, and then start it. I mean, really. I feel bad writing a negative review. The manager is clearly concerned about her guest and the quality of her staff. I don't think anything is mismanaged here; in fact, I think it's managed rather well, from what i could see. But when guests are thoughtless, staff had a limited ability to fix the problem. I'm sure if I'd asked they would have found another room for me -- but did I really want to pack everything up at midnight and move? No. Nor should I have to. Never, never again will I stay at a Best Western. The point is to sleep, and I couldn't. "Room clean but mattresses and door locks needed updating/fixing"
We stayed here with family who were in other rooms - 3 rooms altogether- and all three of our rooms had difficulty with the door locks; as in, we had to keep pulling it to make sure it locked (we were in Rm 123). Otherwise, if we just closed it normally, we could open it right up. We commented on the door locks but felt that although the staff heard us they weren't about to do anything about it. The mattresses are older and not very comfortable. But the continental breakfast was decent as was the coffee and our room was clean. "Very Clean With a Hot Breakfast!" Had lost faith in Best Western due to a bad experience last fall at a BW in Chambersburg, Pa. Drove the extra miles on our way home, headed to Williamsport and held our breath. It was SO worth it! Clean, quiet, comfortable, and a great staff. Great night sleep, and a good breakfast for the last leg home. Will certainly make this a permanent stop-over from now on. Thank you BW Williamsport! 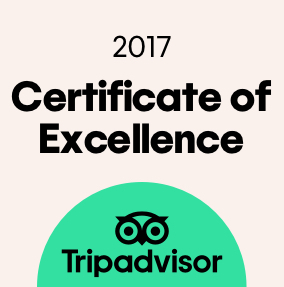 Thank you for the wonderful review I am happy we were able to provide you with a redeeming experience and will share your wonderful comments with our staff. We look forward to seeing you the next time you are in Williamsport. Thank you Again. "Clean rooms with full breakfast included"
Highly recommend this hotel - good value for a low price, plus you get complimentary breakfast. Very convenient if you are traveling through Williamsport, PA. The room, including the bathroom, was very clean and the king-size bed was very comfortable. Many thanks for your review as well as your business with us! We are glad that you enjoyed our clean and comfy environment. You always get a good value when staying with us and we will see you again soon. Thanks for your review of our hotel! Our guests are the reason we're here - so we strive very hard to accommodate them. 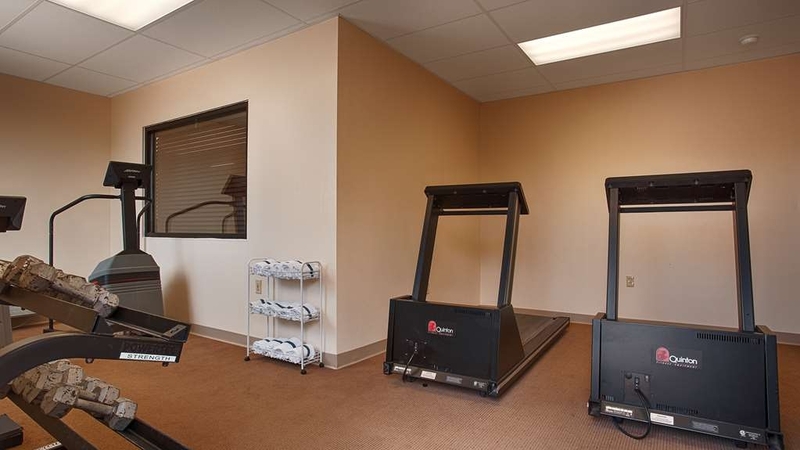 Our convenient location is certainly a bonus along with the free breakfast and clean rooms!! Glad to hear you will be back to visit when in Williamsport. The service provided was very good and both front desk and other staff were friendly in every encounter. The only issue I had with the room was a residual smoke smell in a non-smoking room and the comfort of the bed for me personally. The breakfast, coffee, and WiFi were very good. Thanks for sharing your experience. I am glad to hear that the staff provided you with superior service. I am sorry about the smell in the room and will make sure that the correct department heads are made aware of the issue. Hope to see you again soon. We arrived around 2 am. We were greeted by a very cheerful gentleman, given our keys and asleep by 2:;15. The bed was ooh ssooo comfortable, breakfast was very good and the staff very helpful. We will recommend this hotel to our friends. "Reliable and everything you need"
I stay about once to twice a month for business. My room is always clean and comfortable. The hotel offers an outdoor pool, fitness center and free breakfast. They also have a TGIF restaurant on site. Staff is friendly and always remembers me by name. The only draw back for me is the rooms are adjacent to the parking lot so from a safety perspective anyone can approach your door without passing through a lobby. Thank you for your review. We're so glad you enjoyed your stay with us including our rooms, fitness center, outdoor pool, and full hot breakfast buffet. If you prefer we also have rooms that are next to the lobby for those with safety concerns. We hope you'll visit us again soon! 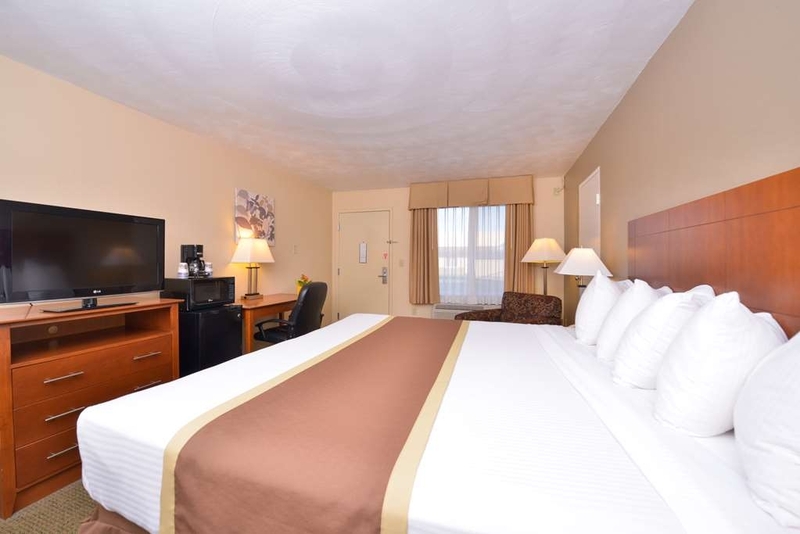 Hotel had excellent value for prices, conveniently located near restaurants. The only disappointing item at breakfast were the eggs, which appeared to be from a powered mix. Mentioned to front desk, they will inquire. Everything else was very good. Would recommend to others and we would come back again. "CLEAN, COMFORTABLE, GREAT VALUE & LOCATION"
VERY clean rooms, smelled wonderfully fresh, quiet, cozy relaxing room with easy chair and 2 queen beds....we stayed 3 nights and had plenty of towels...breakfast was very appealing, very well presented, very clean dining area, the attendant was very professional and clean looking....this hotel is laid out great - parking is close to all rooms, the breakfast area is in the center of all roms, and news papers are readily available....GREAT STAY! We have stayed at this hotel multiple times and never had as bad of an experience as we had this time. We had stayed 2 weeks prior and the guest in the next room kept us up all night. This was corrected appropriately by management. When we arrived this time it was questionable how well our room had been cleaned. We always travel with cleaning supplies so instead of saying anything we spent the first couple hours cleaning our room. The floor was dirty, the dest chair was covered in we don't know what and the desk had cup rings of stickiness. We were very disappointed but continued on to enjoy our weekend. That night our heat wasn't warming the room and it was cool most of the night. The next morning we decided to speak up about what we had found. Management acknowledge our concerns. We did not expect anything for free but don't deserve to pay full price for less than acceptable accommodations. When we checked out there was no compensation for our concerns and the manager on duty said as we were walking away "oh I'll just give you double points for this stay." What I really find odd is EVERY time we stay there we have gotten and email the day after to review our stay...this stay almost a week later still have not gotten the email. So I am going to assume...if you complain they remove your email address so that you don't get the survey...that makes them look better. I doubt that even though we have enjoyed our stay and have quite the amount of reward points saved up that we will every stay there again. There are many other hotels in the area that we can give our business to and we won't have to clean our own room. It is a shame what they do to their "valued" customers...turning them away. I am very sorry that you encountered these issues while you were here with us. I am just letting you know that I have spoken with the housekeeper that had your room and showed her these reviews and action has been taken. Please feel free to contact me if you have any other questions and concerns. Again I am truly sorry for your last experience. Have used this hotel multiple times when needing to get to early work commitments and have been satisfied each time. Good location in center of the strip with easy drive to work, mall and lots of restaurants and shopping. Staff was helpful each time i stayed. Thank you for your compliments, and we look forward to seeing you again in the future. I am sorry that you were not happy with design of the room, the next time that you are in town and need to stay please let us know and we can make arrangements to not put you in a corner room that is designed like that. Have a great day! The room was great. It was clean and very well kept. The bed was very comfortable. The staff was friendly and friendly. I like the fact that TGIF was right next door. This was my second stay at this location and I am very pleased. Thank you for staying with us and I am very pleased to hear you were happy with the staff and everything with your stay. I really enjoyed my stay at the Best Western. The staff was very friendly and the room was very nice. Clean and comfortable. I even took advantage of the on site laundry while I was there. My room was right across from the room where they serve breakfast so it was a little loud and busy in the morning as to be expected but nothing that would deter me from staying there again. If you wanted to sleep late I'd just suggest a room farther from the common areas. I have already recommended this place to family who were in the area to visit. Many thanks for your kind words! We are so proud of the staff, rooms, and breakfast that makes the Best Western Williamsport Inn so special! Thank you for staying with us and we hope to see you again! "Very nice with just one problem"
I stayed here for three nights recently and I was very happy with the accommodations and amenities. I did have one unusual problem which I'd never encountered anywhere before. I sleep with a white noise generator which usually drowns out any extraneous sounds that might waken me or keep me awake. But the heavy doors here, if left to shut on their own, give out the loudest SLAMS I have ever heard anywhere. For two out of the three nights, I was awakened by nearby doors slamming and had trouble getting back to sleep. I hate to say it, but because of this, I don't intend to ever stay here again. Brian, thanks for sharing your experience. We apologize for the less than restful night you had. We know a good night's sleep is every guest's expectation and we regret that we let you down. We hope you will return and allow us an opportunity to give you that 'perfect night's rest'. Always enjoy staying here! Appreciate that they are pet friendly, rooms are clean and nicely appointed. Staff is always friendly. I feel safe staying there alone. Its is in a convenient location. Excellent value for the cost of stay. Thank you for spending your visit with us! We're so pleased you enjoyed our service and hospitality. We'd love to see you again, so start making plans for a return visit! As a regular visitor to hometown Williamsport from Orlando Fl, we had stayed at a nearby '60's style motel with competitive rates. However, we had found during our last stay this last summer, that the gas company workers had increasingly deteriorated the rooms to the extent that the rooms were unfit sanitary wise. It was time to change. This was the first time at the Best Western and now know that our previous searches for this hotel was for the Holiday Inn, as we remembered from the past. We always dismissed the hotel due to the high rates. We finally found the location the same and booked for a week this last Christmas season. 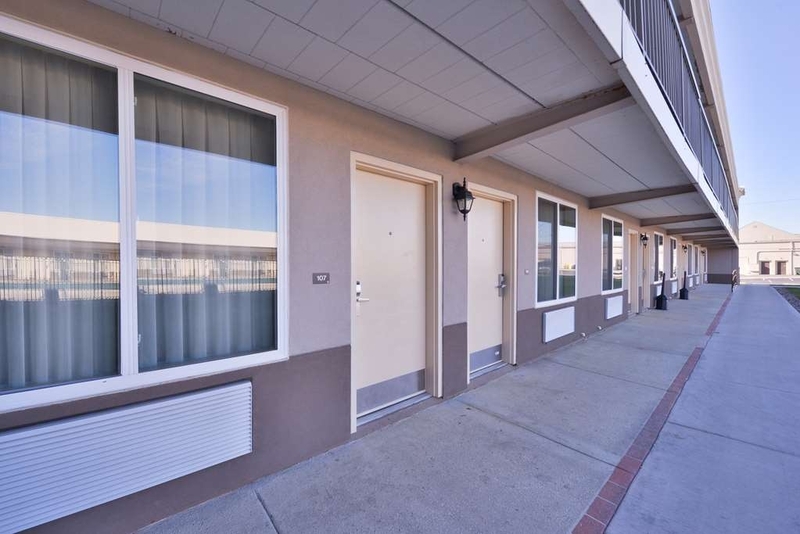 The room was found to be large, carpets clean, modernized amenities and most importantly clean and fresh bedding. One negative, is the fitness equipment is outdated. Richard, we loved your review! Thanks so much for sharing your great experience, and we hope you'll visit again this year! Had to stay in town due to a work issue. I had my wife book my room here, so glad she did. The room was spotless and comfortable. The girl who checked me in was incredibly helpful. Her name was Taylor and she was awesome. While I don't live too far away I would not hesitate to stay here again. We can't wait to share your comments with our staff. Thank you for recommending us and we hope you'll make plans to visit us again soon! "Comfy cozy and all the necessities nearby." We visited Williamsport to catch up with friends over the Thanksgiving holiday weekend. We got a really great deal on a king sized room. We have stayed in Williamsport other times, but this is the best centrally located Inn in the area. The employees were the best, friendly and helpful. Breakfast was yummy, just enough to get us on our way. We will probably return here next time we head to the area. Stayed for two nights while attending a graduation nearby, Check in/out was efficient and the staff was friendly. The complimentary breakfast was a nice way to start the day. once again, all of the staff we encountered was very friendly and helpful. 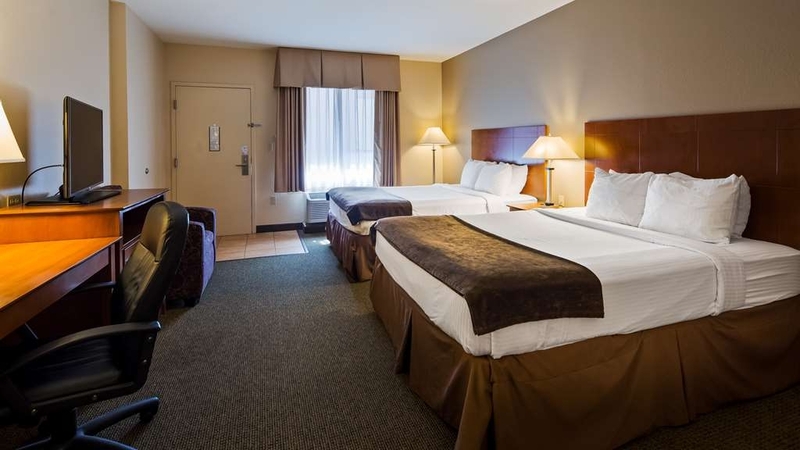 We enjoy our stays at the Best Western Williamsport Inn. We stay there often to visit family. It is well located and the staff is very friendly. We like the free breakfast and the nightly popcorn snack in the office. "Nice spot to stay with a small dog"
We stayed with our small dog overnight - he is just over 1 yr and hears and yes sometimes barks at everything. While many hotels are pet friendly just as this one, they all tend to be loud. Every door that shuts, other guests walking through the internal corridors, etc. This hotel is solid, not a lot of banging or echo's of other guests. Lots of rooms with their own access door and parking right in front of their rooms. For all these reasons, I was very happy with our choice. Nice staff, clean rooms, chain bar/restaurant attached, right in the middle of a commercial district. Plenty of free parking. Rooms on backside, facing pool, are very quiet. What more could you ask for ? "Great hotel at a great price!" I have always liked this hotel as it is situated right in the heart of the commercial district. If you don't want to use the TGI Fridays, there are many other restaurants within walking distance, although it may be easier to drive. The rooms are very nice, too. Thank you for sharing the aspects of you recent stay! We always strive for excellence with our staff and property. We hope you can come back soon for another rewarding stay. 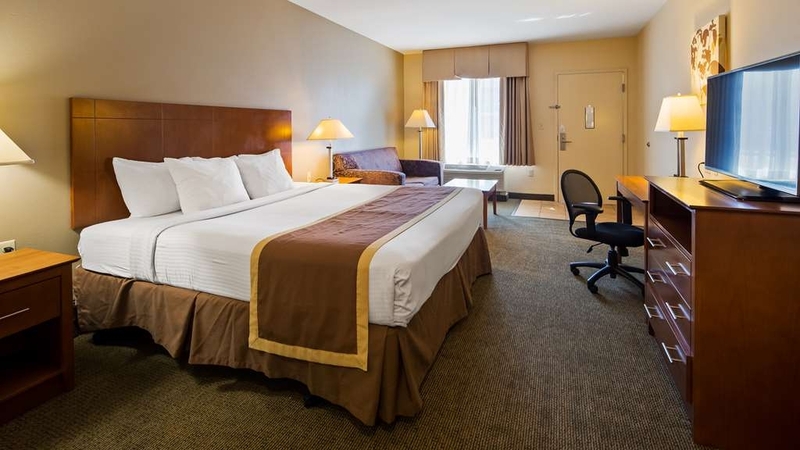 If you need a room for the night, this Best Western is clean and the rooms are spacious. Staff are pleasant and helpful. Excellent value for the price. Easily found by car, it is located adjacent to a TGIF restaurant on an outlying street, not downtown. We had a room located facing the center of the room. It was very quiet. It should be noted this is an older property and has outside corridors, so suspect it might not be easily accessible if snowing or icy. Noisy plumbing in that we could hear both the room toilet as well as adjacent room plumbing all night. Old style noisy heating/cooling system not centrally controlled. Motor lodge set-up with associated noise level of guests (and staff) outside smoking. I was looking for a room on the cheaper end of the spectrum. I was there for business. This hotel had a great price and it included breakfast. It is hard to beat that. I would stay there again. For this range of hotel, I don't think you can get much better at this price. Thank you for taking the time to write a review we are pleased that you enjoyed your stay. We will see you again the next time you are in Williamsport. Walking distance to many good restaurants plus in house restaurant, didn't have to drive anywhere. Just relaxed. Breakfast included, great internet. comfortable beds, lots of channels. Would stay again as this is central location for all of us to meet. My son and I went to this area to look at a college. It was a four hour drive so we decided to spend the night, check out the college in the morning, then leave. The hotel was a bit expensive ,but the cheapest one in the area. Nice location ,T.G.I.Fridays right next door and other dining options close by. Overall good deal! Thank you for your review of your recent stay with us. We are glad you have made use of the great conveniences of the TGI Fridays location. We look forward to seeing you again if you choose a college in our area. Thank you again for your feedback! After a long drive, we were ready for some TLC. It started with the reception staff and getting a clean, comfortable room. Lots of parking here so no worries if you are towing something. Room was clean although dated, bed comfortable. Bathroom could have more light, but acceptable. Breakfast did not disappoint! Staff again were courteous and helpful. We would not hesitate to stay here again. Don't forget to sample the fresh popcorn in the lobby! Dear Rob, We are so happy to hear that you enjoyed your stay along with our fresh popped pocorn and accommodating staff. We hope to see you again the next time you are traveling through! Excellent hotel and staff.Very clean rooms also great to see a nice large fridge in room.We went to breakfast and found a very friendly staff waiting for us at door.We will be staying at best western again soon and we know it will be a pleasent stay again. 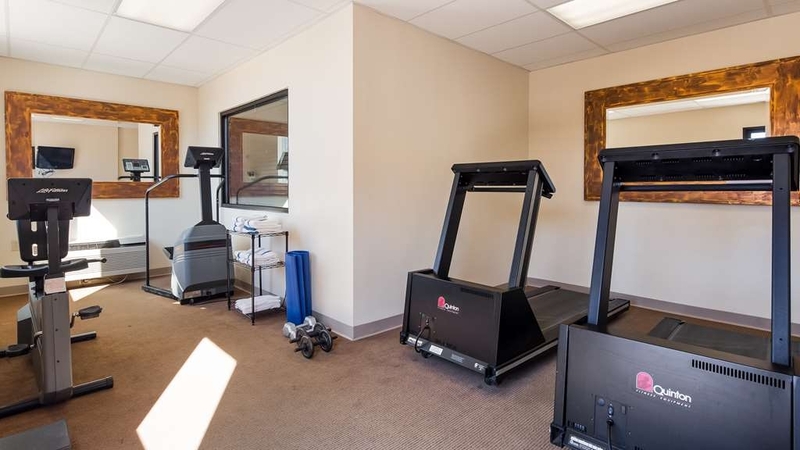 "Great for a quick overnight"
Nothing fancy here, but the room was very clean, the staff very friendly, the breakfast fine, the fitness center in working order (although not the most high-tech equipment). A quick overnight, but everyone slept well and a trouble free visit. Our room was on the first floor, facing the parking lot, so a bit loud early in the evening, but not too bad. If noise bothers you, ask for a room facing the interior, not the parking lot. My Hotwire room was on the second floor at the back corner of the property, but that was fine because there was a stairway right there to give me access to the exterior corridor by my room. I had a very comfortable king bed, desk, microwave, microfridge, TV on chest for clothes storage. Sink area was in main room area, but with no towel rack (demerit). Everything worked well. Some additional electrical outlets at desk and bedside. No chair other than the desk chair, so no place to sit and read or watch TV. I give the towels a D. They could dry me, but barely. Shaving light was OK. Heating/cooling worked fine. Check-in/out were efficient and friendly. Adjacent TGI Friday restaurant and other restaurants nearby. OK stay, bed comfortable and room quiet. Seems old and worn? Part of old impression maybe due to all the loose hardware, bathroom door handle fell of, hand holds in bathroom untrustworthy. Needs maintenance in the worst way. Passed on to front desk. Average breakfast. We loved staying at Best Western. This hotel was so clean and comfortable and great rates! We will definitely return! We especially appreciated the friendly staff. The breakfast was perfect too. I could not believe all the food choices they had for breakfast!! Two night stay. Very clean rooms. Housekeeper Diane, and Linda from the great breakfast area were superb. Made our stay much more enjoyable. These two should be commended for their great service and awesome personalities. The room was very nice. My wife and I slept great in the king sized bed. The service was very friendly. The food at the Fridays next door was good as always and the wait staff was perfect. I would definitely stay her again. Well, we found the location ideal for our purposes and the welcome upon arrival was friendly and welcoming. Our room was located at the back of the building and, although there wasn't anything in particular, it didn't feel clean....maybe it was the carpet. Also, the window (which faced the parking lot...ground floor) didn't lock. I mentioned it to the front desk and was told not to worry and call them if we heard anything. Needless to say, we were still uneasy as the windows are large enough to walk through. Overall, mixed feelings about the hotel. We wouldn't stay a second time. Highly recommend this hotel for work or pleasure, I would look forward to going back. Both check-in and check-out went smoothly. Staff was courteous and professional, and no flaws in the room. you can appreciate good service when you get it. Would definitely stay here again. Had a wedding in town and we're rewards members which made it an easy choice for us. The rooms were clean but the beds were small is my only complaint. Room for my family and I. Free breakfast which had eggs, sausage, etc. very normal continental breakfast but was filling. Connected to a TGI Friday's which was good that we didn't have to drive anywhere to eat. Plenty of places to eat surrounding it also. They had an outside pool so no swimming in September! Staff was friendly. Good place to stay!